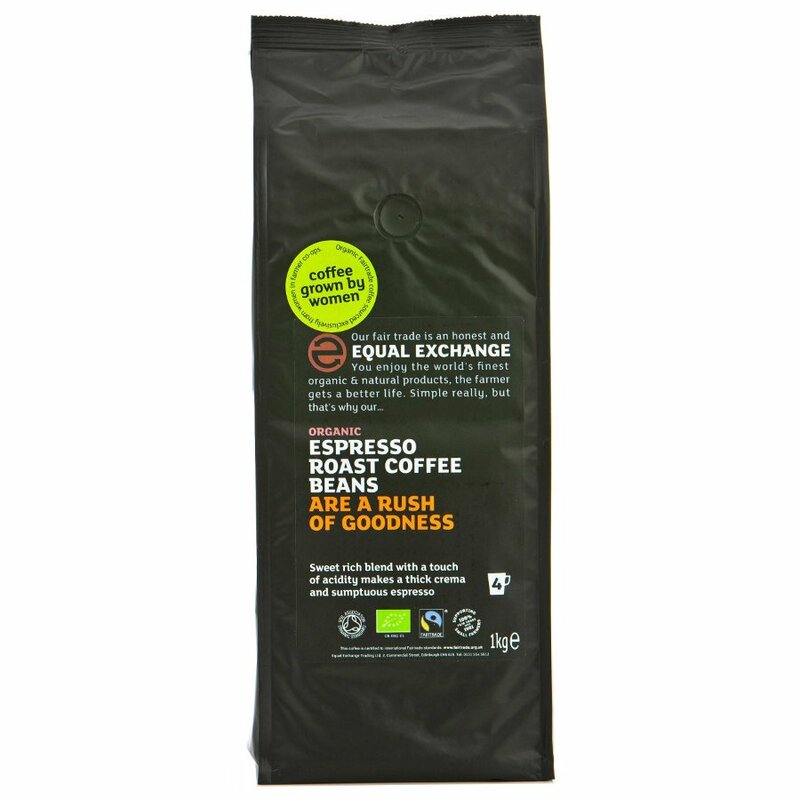 1kg organic, vegan friendly Equal Exchange Whole Bean Espresso, made using fairly traded ingredients. The Equal Exchange Organic Espresso Coffee Whole Beans - 1kg product ethics are indicated below. To learn more about these product ethics and to see related products, follow the links below. Excellent coffee for cafetiere with a deep mellow flavour. I like strong coffee and I use 3 heaped teaspoons for 500ml. I also use a little honey rather than sugar, which works beautifully with this coffee (I have no milk). rnTip: I cut open the bag from the bottom and store the bag upside down with some silica gel bags inside to absorb any moisture. This way the bag's vent is at the top (belt and braces approach). The coffee last for several months (time for me to use it all). We get through a lot of coffee in our house and this 1kg bag provided delicious beans at a great price (compared to other ethically sourced 1kg bags from other websites). Excellent value for money. These beans do indeed make a wonderful, rich espresso. Amazing coffee beans. Just open the bag and you get a delicious smell of chocolate. Always fresh. The best start to anyone's day and from a great company too. There are currently no questions to display about Equal Exchange Organic Espresso Coffee Whole Beans - 1kg.